The ninth annual celebration of Open Data Day on March 2nd was an opportunity to highlight the benefits of open data and encourage the adoption of open data policies in government, business and civil society. This is also an ideal time to reflect on open data implementation around the world. The State of Open Data reviews the development of the open data field over the past ten years and can be used to take stock of the progress and challenges in the field since the first open data day. The report, which is due out in May of this year, will include over 30 chapters looking at different aspects of the open data landscape on open data communities, cross-cutting themes, stakeholder groups, and global regions. The State of Open Data contains a chapter on Open Data and National Statistics with a summary of the major challenges and proposed steps to move the field of open data and national statistics forward and an analysis of scores from all the major open data indices. Like the State of Open Data, open data indices are an important tool to take stock of progress in the open data movement. They can also be used to help countries understand how they can improve and prioritize next steps. 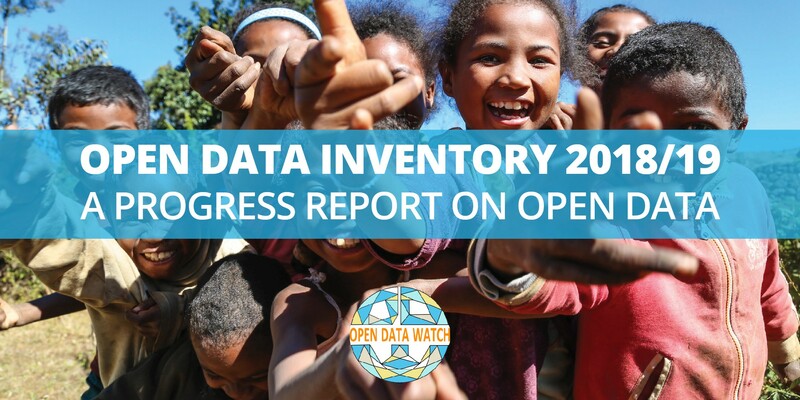 Open Data Watch’s Open Data Inventory (ODIN), first launched in 2015, provides an assessment of the coverage and openness of official statistics in 178 countries. The purpose of ODIN is to provide an objective and reproducible measure of the public availability of national statistics, and their adherence to open data standards. ODIN evaluates openness on a spectrum, measuring the degree of openness rather than classifying datasets as open or closed. ODIN 2018/19 was released just a few days ago on Friday, March 1st. This year’s results indicate that national statistical systems are becoming more open. In 2016 and 2017 the median overall ODIN score remained unchanged at 38, but in 2018 the median score went up by 3 points. Some countries have made large improvements, resulting in new additions to the top ten highest scoring countries. In 2018, Singapore claimed the number one spot, bumping Denmark to second place by just over one percentage point. Although there remains a strong relationship between income level and overall ODIN scores, every country regardless of income status can make improvements in open data. In 2018 the top 20 most improved countries include seven that are low- or lower-middle income and twelve that are upper-middle or high income. If all countries take their open data commitments seriously, the open data goals of the Cape Town Action Plan for Sustainable Development Data, which calls on countries to fully incorporate open data into national statistical systems, can be achieved. This blog post provides only a snapshot of the findings in the full ODIN 2018/19 report. An in-depth look at results, individualized country reports, comparisons with previous years and new interactive figures and charts are all available here. The full dataset of the 2018/19 results are also available for download along with data from all previous assessments. Reading and exploring the new ODIN report is just one way to celebrate Open Data Day. Continuing the celebrations of Open Data Day beyond March 2nd, we are looking forward to the release State of Open Data in May. However, in the meantime, we hope these findings from ODIN 2018/19 push forward the cause of open data so decision-makers have the data they need to change the world.